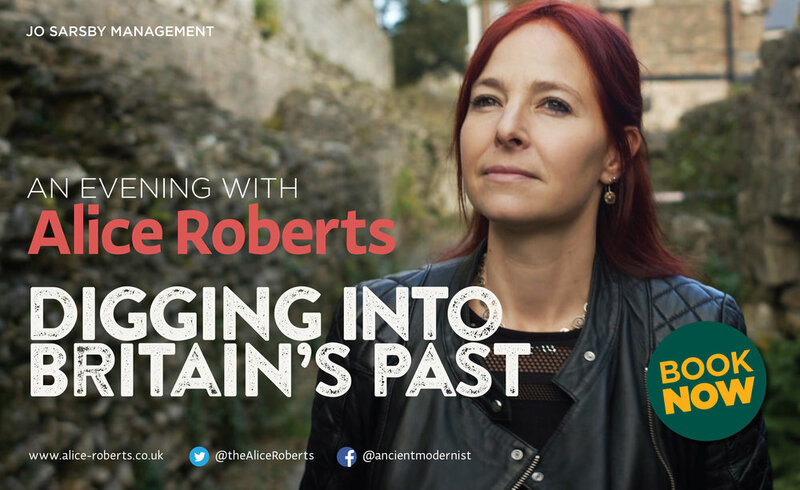 Anthropologist, author and broadcaster Professor Alice Roberts has been delving into Britain’s past, and making archaeology programmes, for nearly twenty years. In this exclusive tour, Alice will share insights, anecdotes and behind-the-scenes stories from her personal journey to explore Britain’s past, with footage from her programmes and excerpts from her books. Each show will finish with 15 minutes Q&A. Alice joined Time Team as a bone expert before going on to present anthropology and archaeology stories on BBC Two’s immensely popular Coast series and co-presenting The Celts in 2015. Alice has presented seven series of Digging for Britain, sharing new archaeological discoveries from across the UK on BBC Four and explored the history of our towns and cities in Britain’s Most Historic Towns on Channel 4 - which will be back with a second series later this year. She has written eight popular science and archaeology books, including The Celts and Tamed: Ten species that changed our world.